Trainer kites are the first step for mastering any power kite sport. Whether it’s kitesurfing, landboarding, kite buggying or snowkiting, the trainer kite is the foundation. This is true even if you have experience sailing, windsurfing or any other sport. We tell everyone the same thing- start with a trainer kite. Won’t it Cost More to Buy a Trainer Kite? No. There are a few reasons why buying a trainer kite is better than moving up immediately to a bigger power kite. Trainer kites are simpler. Because you don’t have to worry about a kite harness, depower or trim straps the process is just simpler. Training kites are cheaper. Let’s assume you’ll spend $600 for a 2 day lesson with a kitesurfing instructor. The majority of that time will be spent having you learning the basics of flying. Now if you get 10 or so hours of practice time in with a trainer kite BEFORE the lesson – you can jump right into the fun stuff without wasting money on the basic exercises. And if you still take the lessons, you will get so much more out of it than going in without the basics. Don’t forget that we also have a buy-back policy where you can trade your trainer kite in for credit towards more gear. Trainer kites are more forgiving. If the wind pulls you forward too fast on a 3 meter practice kite, simply let go of the bar. The kite will depower and then you can collect the training kite with the wrist safety leash and relaunch. Now imagine the same thing happening on a 10 meter kitesurfing kite that is harnessed to you. Of course there are safety systems on larger kites but they are not as forgiving if you make an error. Better to start small and add as you go. These two photos show the difference in size between the kites. Which would you rather make your mistakes with? Trainer kites will help you to progress faster than a full sized kite. Why? Without the added complexity of larger kites, you’ll be able to quickly practice guiding the kite to all parts of the wind window to learn how it reacts. Remember that power kite sports are 80% kite skill so you’ll progress faster once you get those skills down solid. Which is the Best Trainer Kite to Buy? The answer depends on what you want to use it for. Let’s simplify the process by eliminating what we can. We do sell the 2 line trainer kites but because they don’t land, launch and re-launch as well as 3 line kites they aren’t our first choice unless someone has an extremely tight budget. 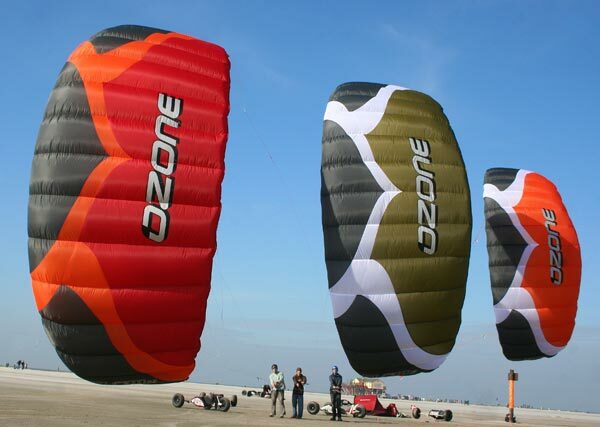 Of the 3 line kites we have the Ozone IMP, HQ Rush PRO and HQ Hydra. The IMP And Rush Pro are very high quality trainers if you want to learn snowkiting, power kite jumping, landboarding or any land based power kite sport. If you want to train on water the HQ Hydra is the only kite that water relaunches. That doesn’t mean you absolutely have to have a Hydra to train for kitesurfing. Remember you can use one of the other trainer kites to practice land and then transfer your skills to water with a larger kite. Remember that all of our trainer kites are brand new and the latest generation made (no, last years model unless we state that). These kites are complete with kite, bridles, bar and line attached and ready to fly. A manual and trainer kite backpback are also included. Think of trainer kites as miniature versions of the kites you'll eventually be flying once you're ready to start riding. Trainer kites are usually about 1 meter to 3 meters in size. This means that unless the wind is incredibly strong, they won't have enough power to pull you up in the air accidentally. Due to their smaller size, these kites are very responsive and easy to maneuver. The larger the kite, the slower it can be to respond, so practicing with a very small, fast, responsive trainer kite will give you a good idea of the finer motor control required to steer. Professional instructors will use trainer kites in the first lessons with any beginners. If you have spent time with your own trainer kite practicing the skills described below, you'll be able to move much faster through this phase of your training. Safety is very important when it comes to learning to kiteboard. When kites are small, the consequences of making a mistake are much less dire. If you're attempting to learn on a full size kite and you make a mistake, it could result in serious injury or even death. One other major benefit to trainer kites is that they are really fun to fly. You may not always have the opportunity to rig up all your gear and get out on your board, but you can often take your kite to the park and have a great time flying it. For those family or friends that are wanting to get into the sport, you can get them hooked by letting them fly your trainer kite. They'll love it. Considering what factors should be included when you decide which kite to buy. Unless you're on a very restricted budget, it is worth spending a little more for a higher quality trainer kite. Keep in mind that this is a kite that will definitely be abused by you when learning as well as every other friend or family member that is going to be flying it. No kite is immune from crashing, but having a low quality kite blow out from hitting the ground too hard is no fun and will mean you'll have to replace it or spend money repairing it. When first learning to kite, understanding what the "wind window" is will help you visualize how you'll need to position your kite to generate power and where along the wind window you'll have a "neutral zone" or area where there is less pull. Think of the face of a clock. You would be at the center of the clock in this visualization and you would be facing directly downwind. The position directly to your right is 3 o'clock. The position directly to your left is 9 o'clock. Directly overhead would be 12 o'clock. Your kite can travel along the outside edge of this "clock", but can also travel directly downwind as well as any point in that area using your position as a tether. The "neutral zone" is the area along the edges of this wind window from the position of 9 o'clock across the top of the arc to 3 o'clock on the other side. When your kite is along this position, it will have much less pull. The less you move the kite, the less pull it will have. The faster you move your kite, the more power it will have. The greatest power and pull from the kite will come when it travels through the main downwind area, also called the "power zone". Launching the trainer kite is relatively easy to do, especially if you have an assistant. Whether self-launching or launching using an assistant, the kite should be placed at either the 3 o'clock or 9 o'clock position. Depending on the amount of wind, you can move a few feet upwind or have your assistant take a few steps downwind to have the kite inflate or catch the wind without any fluffing. Once your kite has sufficient tension on the lines, you can then steer the kite to the top of the wind window into this 12 o'clock "neutral zone". Steering the kite is a matter of pushing and pulling the bar. Many new students have a tendency to want to steer the kite like they would a car with a steering wheel motion. The kite control works only on tension which means that a simple back and forth motion with the bar being parallel to the ground will steer the kite much more effectively. If the bar that controls the kite is turned like a steering wheel, there may not be a change of tension which means the kite will continue to move in the same direction. With your trainer kite, try the pressure back and forth along that line and you'll find that when you want the kite to go right, you'll pull right. When you want the kite to go left, you will pull left. These are the basics, but keep in mind that if the more accurate description of kite movement isn't about right or left, it's more about clockwise and counterclockwise. This is because when you pull on a given side of the bar, the pressure on the side of the kite you're pulling will be the "pivot point" for the kite itself. So, if you pull with the right side of the bar, the right side of the kite becomes the pivot point for the kite and the side with less pressure (in this example the left side) moves which produces a clockwise rotation. The reason this is important is because if you're thinking only of left and right, this is reversed when your kite is upside down. This may be a bit confusing at first, but you'll soon get the hang of it once you're flying the trainer kite on your own. The most important component is to remember that steering the kite happens with a back and forth motion, not a "steering wheel" motion. Once your kite is flying and you're comfortable with the basic movements, you can practice a figure 8 motion at the top of the "wind window". Take your kite to the 11 o'clock position, then pull right to have the kite begin to move to the right or make that first clockwise rotation. Even out the tension once the kite starts moving towards the 1 or 2 o'clock position, then pull with the left side to create the counterclockwise motion that will turn the kite. Straighten out again by evening the tension once the kite is headed back towards the 10 or 11 o'clock position. The end result is that the kite will create a figure 8 motion in the sky above you. This is a relatively easy, basic motion that can be used to learn to control the kite. Once you're confident with the figure 8 motion and can control your trainer kite, you'll be ready to learn the power stroke or the power dive and then tacking. These are the moves you'll be performing with a much larger kite when you're ready to get into the water. 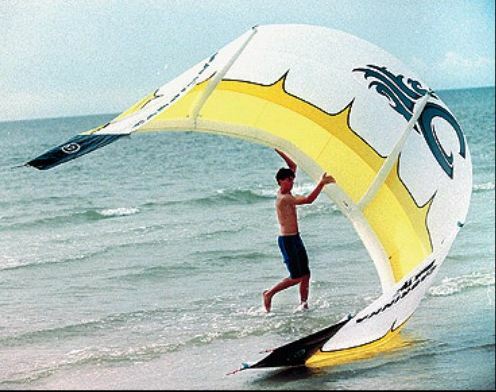 In order to start riding a board on the water, you'll need to generate enough power with the kite to pull your body out of the water and begin planing. This requires a serious amount of power which is why you'll dive the kite through the power zone in order to pull you out of the water. For this example, we'll say your plan is to go left. The process would be to have your kite in the "neutral zone" at 12 o'clock. To have enough room to dive the kite, you'll want to bring the kite into the 1 or 2 o'clock position (still in neutral along the wind window edge). Once you have the kite in that position, you'll pull as if you were doing a figure 8 but instead of allowing the kite to straighten out towards the 11 o'clock position, you'll dive the kite directly towards the ground or in a slightly left of center position. This will generate the pull needed to get you out of the water, or in the case of the trainer kite could easily bring you from a seated position with your legs in front of you to a standing position. Keep in mind that once you've generated the initial pull, your kite is still heading directly towards the ground. If you don't pull the kite out of the dive, it will crash pretty hard into the ground. This means that the power dive is in two parts, the dive, then the recovery. This dive of the kite from 2 o'clock down towards the ground should be followed by a pull with the right side of the bar in order to bring the kite back up towards the 10 or 11 o'clock position. This is the basic power dive. You'll be practicing this in conjunction with what comes after this move which is tacking. In any case, this should be practiced using both directions, right and left. Tacking is a sailing term that basically means going back and forth, usually to take advantage of the need to move either into the wind or in a direction diagonal to the wind. In the case of kiting, this is simply the process of moving in a chosen direction using an up and down motion of the kite to generate the constant power needed to keep you planing on the water. Using the original example from the power dive, we'll assume you're still going to be going left. After you have brought the kite out of the dive, up towards the 10 to 11 o'clock position, you'll need to keep the kite moving or if the wind is strong enough, you may be able to just "park" the kite in the right position to keep enough power in the kite so that you can avoid sinking back into the water. The motion is an up and down motion in the direction you're going from somewhere between 10 and 11 o'clock. Keeping in mind that you're moving, the up and down motion would create a wave pattern in the sky. One other note is that this movement won't necessarily be on the edge of the wind window or along that "neutral zone". 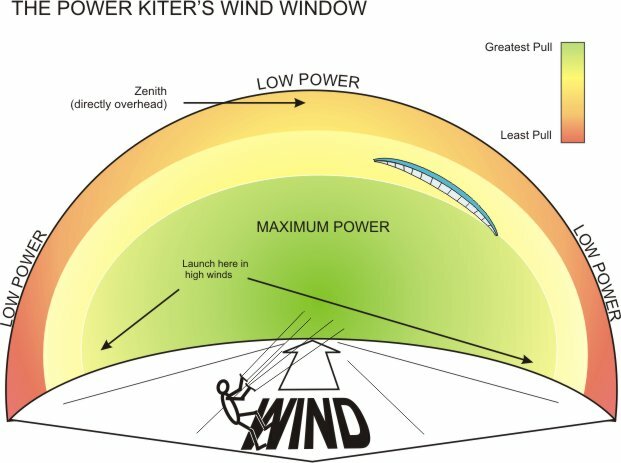 The location of the kite itself will be more downwind and the movement of the kite up and down will help keep the kite there in order to stay powered. There will be times that you won't need to move the kite at all in order to maintain power. If the wind is strong enough compared to the size of your kite, you'll be able to "park" the kite and keep tension on the lines by using your board to edge against the wind. With your practice kite, you can simulate the movement simply by walking slightly upwind in the same direction you're moving the kite in the up and down motion. Practice coming back the other way by slowing bringing your kite to the top of the wind window (12 o'clock), then back to the other side between 2 and 1 o'clock with the same up and down motion. Landing the kite is usually easier with a partner, especially if you have an inflatable kite. With a partner, the sign you'll give when you're ready to have some help is to tap your head maybe 2 or 3 times. 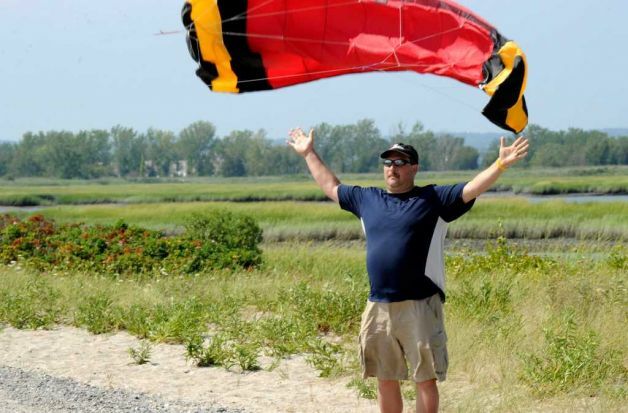 Make sure someone is watching and have a plan whenever possible for landing your kite. Most kiters understand the sign that you want some help with your kite. This is recognized all over the US and in most international locations as well should you need help landing your kite. In the event you don't have a partner, the easiest way to land the kite is to bring it back to the edge of the wind window (either 3 o'clock or 9 o'clock) and pull the safety. Depending on your kite, it may be just as easy to pull the safety when the kite is directly overhead. Use common sense and situational awareness to know what potential obstacles there are and especially watch for the potential of your lines getting caught on objects or people. Kiting can be extremely fun and rewarding. If you're careful and prepare in advance with visualizing potential dangers, you'll be better prepared to avoid them. Practicing with your trainer kite is an excellent idea and can give you a real head start when it comes to lessons with a professional instructor. As you're able to demonstrate your skills at the above mentioned techniques, you'll be that much closer to water starts and "body dragging"